The Ram Zebra putter was the first really popular D shaped putter. Its soft rounded shape alone would make it difficult to align consistently, hence the Zebra lines which of course became its trademark. The lines were all black on the original putter (as in the picture here) and later models have a white centre line. These lines revolutionised putter design as other manufacturers saw just how popular a good alignment feature was. The grey material of the head is designed to prevent glare from the sun. 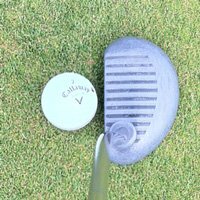 Whilst this is effective, it looks pretty shabby after the putter has been knocked around in your bag for a while - the dents and dinks show up pretty clearly, unfortunately. All in all the look of this iconic putter has been popular with generation after generation of golfer and its round shape and very prominent aiming lines have been much copied as a result. Compared with the pure feel of a milled putter the Ram Zebra putter fails to impress. The sensation of the ball striking the putter is a very dull thud. The Ram Zebra was one of the first highly popular face balanced putters and these have a very different feel from a toe weighted putter. The feel is that the face is trying to stay square to the target, rather than rotating open on the backswing and closed on the throughswing. The Zebra has this feel in spades. A great putter if you often pull your putts or are trying to achieve the Dave Pelz "square-to-square" style of stroke. The head of the Ram Zebra putter is hollow and if you use one without the dense foam packing that was supplied by the manufacturer the sound is really quite nasty. If you're buying a used Zebra, make sure this foam insert is included. There are removable weights in the later versions of the Zebra under a base plate of the putter which covers the bottom of the hollow head. Remove this plate and you will find circular weights which slot onto a bar with a bolt to hold them on. Using these weights you can vary the weight of the head considerably. This customisation feature was revolutionary for its day, but Ram made very little of it. In fact, I suspect many people used and are still using their Ram Zebras without knowing about the ability to vary the weight. The roll of the ball off the Zebra was, in truth, nothing special. It had none of the roll or feel you'd expect from a high quality milled, insert or groove faced putter. The rarer Zebra Deep Face model gives you a much better feel due to the higher centre of mass, so our advice would be seek one of these out - they're still available if you hunt hard! A great putter if you're having trouble lining up. All those lines certainly make aiming a lot easier. However, the roll is a bit of a let down. Our advice is to search for a Deep Face Zebra if you're dead set on owning one.